1997 MAZAK QT6-6T CNC LATHE WITH MAZAK ROBOT FLEX GL-6 LOADER / UNLOADER, MEZATROL T PLUS CONTROL, 1.26’’ BAR CAPACITY, 6’’ CHUCK, 16C COLLET NOSE, 12 STATION TURRET, S/N 129226. 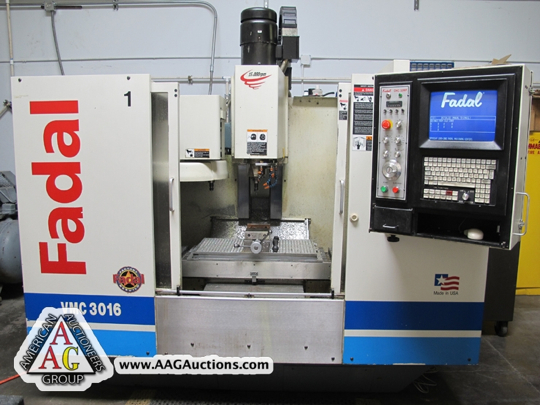 FADAL 3016HT CNC VMC, WITH 15,000 RPM, CT 40, 21 ATC, CNC 32MP CONTROL, S/N 031986050483. 1986 WEBB 17 X 49 GAP ENGINE LATHE, MODEL B57078, 3 JAW, 5C COLLET NOSE. SHIZOUKA CNC BED MILL WITH BANDIT CNC CONTROL, ATC. BROWN AND SHARPE 6 X 18 MICROMASTER SURFACE GRINDER. SAKAZAKI SG-6 UNIVERSAL TOOL GRINDER. BURGMASTER 6 HEAD TURRET DRILL PRESS. 2006 GARDNER DENVER INTEGRA 25 HP ROTARY AIR COMPRESSOR. PROFESSIONAL FINISHING ROTARY TUMBLER MODEL 300WT. BALDOR GRINDERS, SANDERS, POWER TOOLS, CT 40 TOOL HOLDERS, ETC. END MILLS, CUTTERS, COLLETS, VISES, CHUCKS, TOOLING, TOOL BOXES, KDK HOLDERS, POWER CHUCKS, 16C COLLETS, AND TOOLS.